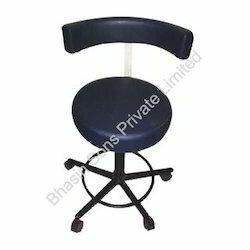 We are way forward in manufacturing and exporting an assortment of surgeon's stool (pneumatic). These products are designed with latest technology and advanced machineries with supreme quality stainless steels. The wheels at the bottom enables the user to rotate anywhere inside the hospital. Our product provides much comfort with cushion seat and stylish back rest attached to the seat effectively. Superior doctors use this product for its royal look. 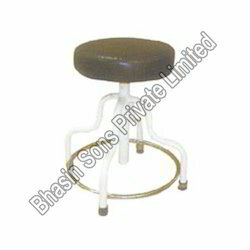 We hold the expertise in developing and exporting Patient Stool Revolving Cushioned Top. Our company has patiently designed these products using premium grade of steel and cushion materials sourced from top dealers around the globe. The adjustablescrew attached between the seat and stand enables the user to vary the heightat an ease. These products provide much comfort and luxury to the user efficiently. Mounted on four rubber shoes with ring. 35 cms dia upholstry top fitted with strong and accurate machine screws. Height adjustable from 45 to 68 cms max. By means of wide distribution association, we offer a wide range of Revolving Stool that has a huge adequacy throughout the world. 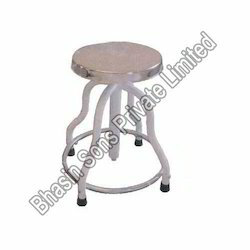 These revolving stools are manufactured in compliance with the specification of international quality standard. It finds its application many hospitals and clinics. These products are provided with Height adjustable through pneumatic pump and Stainless steel ring for footrest for user-friendly operation. This is widely reputed due to its esteemed reliability. 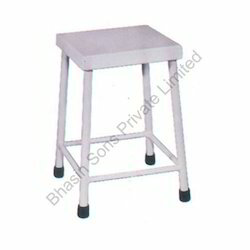 Bhasin sons private limited is one of the leading names in the field of manufacturing and exporting ward and visitor stool. We manufacture these products using premium quality stainless steel materials procured from top dealers around the globe. These products are placed at the reception for the convenience of the out patients. This ward stool is also found at all wards for the visitors seating arrangements. Our product is widely used at almost all hospitals. Looking for Hospital Stools ?